We were awarded Google and Institute of Strategic Dialogue Innovation Fund in early 2018 to develop 360 degree videos to address hate and extremism in schools. The fund is supporting innovative projects on and offline that seek to disrupt, undermine, counter or provide positive alternatives to hate and extremism. Our project is aimed at children from 9 years to 11 years of age. The 360 videos, which would be viewable via virtual reality viewers (e.g. Google Cardboard) or via YouTube, will capture the experiences of children who find it difficult to connect with others from different backgrounds. We are hopeful that the immersive experiences will help to generate empathy for others and to promote values of tolerance and anti-hate. The 360 degree videos in this project will allow students and the wider public to experience a “day in the life” of a young person from a socially excluded community, and in doing so foster social inclusion in a new immersive and engaging way. More details of the project are at this link. Colleagues involved at The Open University are: Peter Bloom, Evangelia Baralou and me. Our paper has been published in Journal of Virtual Studies, vol. 9, no. 2, 2018, pp. 25-36. 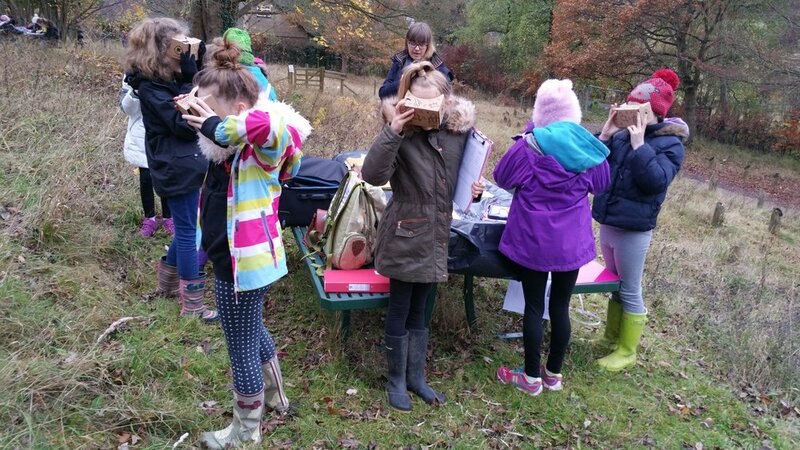 In this paper, we have reported students' experiences of using Google Expeditions, a mobile virtual reality application, to learn about the environmental impact of large scale developments on nature reserves. Students were on a geography field trip to Prestwood Nature Reserve not very far from their school. They looked at Borneo rain forests via the Google Expeditions app while in the field and became aware of the issues created by large-scale development on the environment. They were able to discuss and reflect on the implications of planned large scale development (a high speed railway, called HS2) close to their local nature reserve (that they were visiting) in the Chilterns. We are grateful to our colleague, Dr Trevor Collins, Knowldege Media Institute, UK's Open University, who guided us on how we (the research team) could use Google Expeditions and the kit (mobile phones, router and the Tablet) in an outdoor field trip. Mrs Melanie Collins, Head of Humanities, Pipers Corner School, ran the field trip and is one of the authors of this paper. 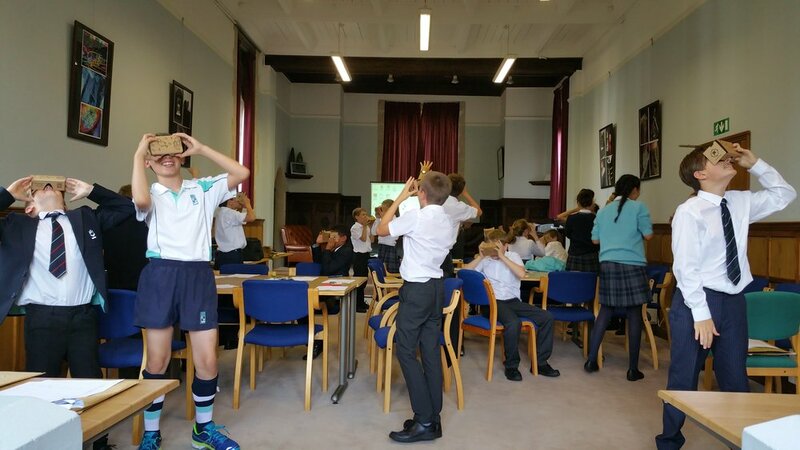 The Open University (OU), UK, has been conducting a school-based research project (funded by Google and the OU) on the potential use of mobile virtual reality via Google Expeditions in science and geography in school education. For more pointers to blog-posts and news items related to our research on Google Expeditions, please see our project web-page on Google Expeditions. Over the last two years, a team of researchers at The Open University (OU) has been investigating the role of activity monitors in socialisation and in improving the wellbeing of people aged over 55 years, of carers, and of people being cared for. Activity monitoring technologies such as those from Fitbit, Garmin and Samsung help to track activity, exercise, food, weight and sleep. In the digital health wearables event on 16 January 2018, we will showcase the results of this two-year research programme funded by Sir Halley Stewart Trust and the ESRC Impact Acceleration Award. In addition, speakers from public health and industry, and users of these technologies will discuss their views and future directions these technologies and similar digital health wearables will take in supporting active and healthy ageing, in caring, and in self-monitoring of health. If you would like to know more about the symposium or receive a summary of the symposium's proceedings, please contact us via the comments on this blog-post. On 13 December 2017, Dr Ana-Despina Tudor (@AATudor) and I presented a webinar at the ALT Online Winter Conference 2017. Virtual reality is becoming pervasive in several domains - in arts and film-making, for environmental causes, in medical education, in disaster management training, in sports broadcasting, in entertainment, and in supporting patients with dementia. An awareness of virtual reality technology and its integration in curriculum design will provide and enhance employability skills for current and future workplaces. In this webinar, we described the evolution of virtual reality technologies and our research in 3D virtual worlds, 3D virtual environments developed in Unity 3D, and mobile virtual reality via 360-degree photospheres (e.g. as in the Google Expeditions app) and 360-degree videos. We discussed the technological and pedagogical affordances of virtual reality technologies and how they contribute towards learning and teaching. We discussed the significance of using virtual reality in education, in training and skills development, and for employability. The presentation can be downloaded as a pdf from here (16.5 MB). Webinar recording is at this link. Compiled by Dr Ana-Despina Tudor: Please refer to the presentation (pdf file) for the context of the questions. Question: Other than Google, are there any virtual reality (VR) education companies/start-ups out there that you would recommend we should have a look at? Daden, consultancy in the UK: http://www.daden.co.uk They have developed several applications for training and education. “Fieldscapes” (https://www.fieldscapesvr.com) has a mobile VR field trip to the Carding Mill Valley in Shropshire, UK. Question: How have you dealt with accessibility in VR? For example, hearing-impaired students in Second Life when voice chat is going on, or visually-impaired students seeing what is going on at all? In Second Life, we tend to transcribe along with a voice chat. In fact, I (Shailey) have done live-transcriptions in various Second Life events to describe the voice chat and context of conversations so that hearing-impaired users are catered for. For partially-sighted users, we tend to describe the scenes as we go along but I (Shailey) have encountered more of hearing impairments in Second Life than visual impairments. The Google Expeditions App doesn’t have any audio. So, it is not a barrier for people with hearing impairments. However, the App can’t be used effectively for partially sighted people or with no vision at all unless the usage is accompanied by some audio commentary. When Google Expeditions runs in the Lead or Guide mode, for example, when an educator is driving the demonstration or lesson, there is an introductory text and examples of questions for each of the scenes in the expedition – which an educator or a teaching assistant may use to describe the scenes. When the Google Expeditions app was first launched, the app could only run in the ‘follower mode’ (student) but the students can also run the expeditions in 'guide' mode – and, therefore, have descriptions of the scenes. So, even a fellow student may be able to help describe the scenes to a visually impaired student. Further, a partially sighted user may choose to run the expeditions on a Tablet (bigger screen) and without the VR viewers for greater visibility of the scenes as compared to a phone-screen. Question: As a replacement for real field trips, is there any worry of losing out on new discoveries? You can only experience what has been created by your teachers — you can't prove them wrong. We don’t perceive virtual field trips as a replacement for outdoor fieldwork. The design of the virtual geology field trip (Virtual Skiddaw) was based in the learning activities and curricula and our geologist colleague Dr Tom Argles replicated the physical field trip in the design of the virtual field trip. But we do understand your point about the selectivity by the educator and missing out the aspects that students would otherwise observe if they were in an outdoor field trip. This may be another critical reason that virtual field trips should be seen as supporting a physical field trip rather than replacing it. Using a virtual field trip before a field trip can familiarise students with a place, can help them assess the risks and prepare better, can raise their curiosity and help them formulate questions and conduct research while in the field. During the field trip, students can use the virtual field trip(s) to compare locations. After a field trip, VR can be used to help students revise their learning and re-visit locations from a different perspective. In Google Expeditions, there can be indeed a selectivity effect of the virtual locations being shown, as pointed out in this question. However, the 360-degree view gives the whole picture of a location. Students can look up and down, left or right. The content creators have used so far birds’ eye view images, images from the ground level and underwater. Also, there are apps such as Cardboard Camera that allow users to take 360-degree photospheres. If students are able to visit these locations, students can compare the photospheres they took with the ones taken by the educator and have a comprehensive view and perception of the place they have visited. Question: How do you account for variations in student digital literacy? So far we haven’t faced any issues with students using the mobile VR on smartphones. As researchers, we have been at hand to help during lessons too. We were invited to run lessons using Google expeditions by those educators who had already been using technology-enabled initiatives in their lessons. There are many educators who raised this concern and noted that many of their colleagues might find the technology difficult to manage for a class, such as: charging up to 30 phones, conducting system updates, downloading and maintaining the latest version of the app, running the app, setting up the network so that the tablet of the educator communicates with the smartphones used by students. We feel that it is the educator’s digital capability and digital literacy that will influence the students’ digital literacy and capabilities. Question: Do you prefer the students to sit on chairs, fixed chairs, rotating office chairs, cushions on the floor or stand? It depends on the preference of students and educators. Some students preferred to stand while others were lying on the ground. When students stood up, they were advised to turn around but not walk around, as they might stumble or hit furniture. Educators gave them frequent pauses to discuss what they were seeing or to do some written activities so that they don’t feel unwell or feel nausea by looking at VR without breaks. Question: top tip on where to start - low cost? The Google Expeditions app is free and can be downloaded on iOS and Android phones. You will need to buy a VR viewer (starting from £5). Also, there are online guides on how to build your own cardboard VR viewer. As an alternative and in the absence of smartphones, educators can use the app on tablets (but it would be a 2D effect only). You can also download other Apps such as the Guardian VR to get a feel of the potential of this technology and its possible use in education. Question: Are there any VR or AR projects to expand beyond visual and audio senses (such as touch), to completely immerse in a virtual world? Our Sir Halley Stewart Trust funded project addresses the interlinked issues of the process of becoming older, wellbeing, loneliness and social isolation, and taking photographs and sharing them online through applications such as email and social media (e.g. Flickr, Facebook, Instagram). If you are aged 60 years or over and live in the UK, we would like to know about your experiences of sharing photographs online via applications such as email or social media (e.g. Google Photos, Flickr, Instagram). The survey will take 8-10 minutes to complete. The research design of this project has been approved by The Open University's Human Research Ethics Committee (HREC/2017/2498/Minocha). If you have any queries about the survey or if you would like to reach us on email, please contact Dr Sarah Quinton of Oxford Brookes University (sequinton@brookes.ac.uk) or Professor Shailey Minocha of The Open University, UK (shailey.minocha@open.ac.uk). 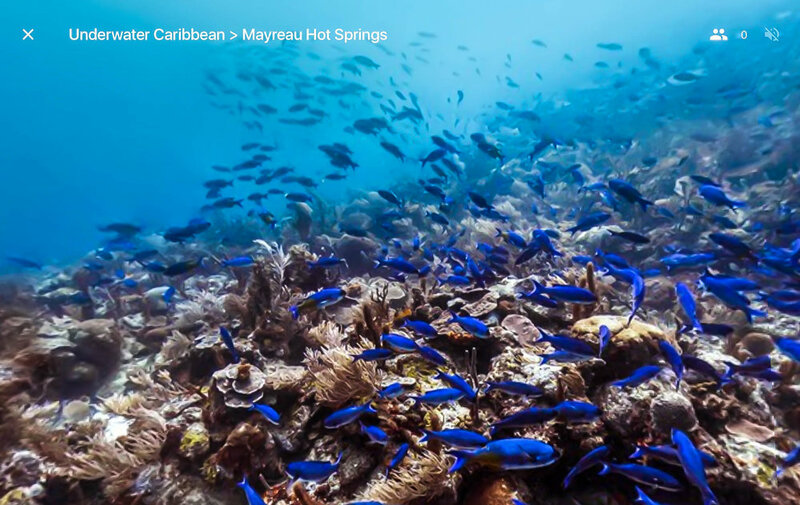 Google Expeditions comprise of 700 expeditions - which are 360-degree photospheres of places and events - for example, Buckingham Palace, The Great Barrier Reef and the coral bleaching in the Reef due to climate change, Borneo Rain Forest, and the International Space Station. These visualisations enable students and teachers to experience places that may be hard or even impossible to visit in real life. There are simulations too in the Google expeditions app - for example, the respiratory or the circulatory system in a human body, the solar system, the activity in volcanoes during eruption, etc. These simulations are virtual representations of otherwise invisible concepts, processes and events. These are some of key research strands from our project which we discussed in the CNN article/interview. The authenticity of the physical spaces in the Google Expeditions facilitates the students taking up role(s) of professionals who belong to that context (e.g. astronauts on the International Space Station (ISS), or divers in Great Barrier Reef). The perceptions towards this affordance of first person perspective, as uncovered in our research, are sense of presence and taking the role(s) of persons inhabiting the environment. Inquiry-based learning (IBL) involves students collecting and interpreting data, and synthesising the information and evidence to address real-world problems in subjects such as history, science and geography. Inquiry learning enables the development of skills for scientific inquiry such as problem-solving and critical thinking. Questions are at the core of any inquiry – questions that the students are curious about and which are situated within the learning outcomes of the lesson. We have seen that Google Expeditions create a curiosity or need to know, if shown at the start of the inquiry process. The affordances of Google Expeditions facilitate student-questioning and development of high-order questions - more analytical and evaluative than students are able to formulate by looking at videos, pictures, text, etc. In our year-long research project, we have investigated how Google Expeditions bridges virtual fieldwork with physical field trips, facilitates inquiry-based fieldwork and experiential learning and improves the effectiveness of outdoor fieldwork education. On 5th July, we presented our paper 'Affordances of Mobile Virtual Reality and their Role in Learning and Teaching' (available from Open University's Research Repository http://oro.open.ac.uk/49441/) at the British Computer Society Interaction Conference at University of Sunderland. In this paper, we have reported the technological affordances of a virtual reality smartphone-driven educational app – Google Expeditions. An affordance implies the educators' and students' perceptions of how Google Expeditions (GEs) mobile virtual reality support their teaching and learning, and influence their experiences with virtual reality (VR). Based on a large exploratory study in Google-funded Virtual Reality Research Award, we have identified 10 affordances of GEs in our data. In the paper, for each of the affordances, we discuss the perceptions of our participants: how their experiences of learning and teaching with VR were shaped by GE’s affordances. For each of the affordances and the associated perceptions, we have included quotes to exemplify the experiences. resources available including time, budgets and opportunities for continuing professional development of educators. Our findings suggest that the most effective use of VR will be when it is combined with other technologies such as videos, podcasts, wikis, blogs or forums, and mobile apps. The adoption of VR in education is still in its infancy and its development will progress and mature as educators (and students) perceive and exploit the affordances of this technology for their teaching and learning. Please have a look at our paper and please leave your comments/queries below. Geographical Association (Ms Rebecca Kitchen). In this Sir Halley Stewart Trust-funded project on digital health wearables for people aged over 55 years (May 2016 - July 2017) and in collaboration with Age UK Milton Keynes (MK) and Carers MK, our aim was to investigate whether and how wearable activity-tracking technologies can acceptably contribute towards self-monitoring of activity and health by people aged over 55. Example technologies include trackers from Fitbit, Garmin and Samsung, and smart watches. Typically, these devices record steps walked, sleep patterns, calories expended and heart rate. the role of digital health wearables in caring, self-management of health, post-operative monitoring of mobility, and for monitoring movement and locations in conditions such as dementia and Alzheimer’s disease. Citing this report: Minocha, Shailey; Banks, Duncan; Holland, Caroline; McNulty, Catherine and Tudor, Ana-Despina (2017). Investigating the role of wearable activity-tracking technologies in the well-being and quality of life of people aged 55 and over. Report submitted to Sir Halley Stewart Trust, The Open University, Milton Keynes, UK. The views expressed in this report are those of the authors and not necessarily those of the Trust who funded this project. Ageing population, retaining independence of older people, support to carers, and using internet-enabled technologies to transform healthcare services are some of the national concerns. We are now involved in a multi-way knowledge-exchange (KE) programme (April 2017 - January 2018) through an ESRC Impact Acceleration Account Award to set up dialogues with/between key stakeholders including manufacturers for improving the design of digital health wearables for older users, carers and medical professionals. The Open University (OU), UK, in collaboration with Oxford University, Age UK Milton Keynes and Carers Milton Keynes, is involved in a research programme related to digital health wearables for older people, carers, and people being cared for. The research programme consists of two projects. The first project was funded by Sir Halley Stewart Trust and a poster based on the research carried out on one of the strands of this project is here. The details of the second ESRC-funded project in this research programme are in this pdf. This project is focussed on knowledge exchange with a variety of stakeholders including manufacturers of digital health wearables. As a part of the ESRC-funded project, we organised a multi-stakeholder workshop with 16 attendees involving the project team, carers and manufacturers on 16th June from 10 am to 13:15 at the OU's campus in Milton Keynes. The aim of this workshop was to link up the requirements and expectations of older people, carers and people that we have collected so far in the Sir Halley Stewart Trust-funded project, with manufacturers and policy makers in a multi-way knowledge exchange. Our (the research team's) objective is to influence the usability and service design of digital wearables for older people, carers and people being cared for based on the evidence that we have consolidated in our empirical research. This workshop is a part of series of workshops that we will be organising on this project until the end of this year. Are you a manufacturer of digital health wearables? My inaugural lecture Virtual Worlds for Real Experiences will be held on Tuesday, 20 June 2017 at The Open University's campus in Milton Keynes, UK. I will discuss how online technologies such as social software, activity trackers, virtual reality and 3D virtual worlds bridge time and places, interleaving the virtual with the real – allowing people to communicate and collaborate with those whom they may have never met, experience places they may never be able to visit, shop, learn, and do research. virtual reality and 3D virtual worlds. how online technologies can support individual and collective learning, skills development and knowledge construction. scaffolding social norms, rules, roles and etiquette for interactions. The live-stream on the day and the video recording after the Lecture will be at this link. Could an app replace a trip to the doctor? Babylon raises £50m to perfect its AI Doctor, CITY A.M.
Workshop title: Investigating the role of virtual reality in geography via Google Expeditions at the Geographical Association's 2017 Annual Conference on Friday, 21 April at 9 am. About Google Expeditions: Google Expeditions is a Virtual Reality mobile Application (app) which consists of field trips of places that students experience on a smartphone through a Virtual Reality (VR) viewer called Google cardboard. The Google Expeditions app (available for Android and iOS platforms) has more than 500 expeditions. An expedition comprises of 360-degree photospheres of a location (e.g. Rio de Janeiro). Google Expeditions enable visualisation of locations which may not be feasible or easy to visit in real life (e.g. Galapagos islands or the Tolbachik volcano). Further, Google Expeditions have simulations to envision concepts and systems such as the human heart, the respiratory system, or the process of pollination. Details of the workshop: Participants will have the opportunity of a hands-on session with Google Expeditions and will be invited to discuss/evaluate the outcomes of a Google-funded project that has investigated the role of virtual reality in geography and science school education. How smartphone-driven Virtual Reality like in GEs can support geographical enquiry? How smartphone-driven Virtual Reality like in GEs can complement physical field trips? In the workshop, we will specifically focus on the role of Virtual Reality in geographical enquiry - both in the context of classroom practice and for physical field trips. We have received funding from an ESRC Impact Acceleration Account (IAA) in a partnership between The Open University (OU) and University of Oxford for our project: Designing Wearable Activity Monitoring Technologies that work well for Older Users and Carers (Project reference: 1702-KEA-282). The project will run from April 2017 to January 2018. Wearable activity monitoring technologies include, for example, trackers from Fitbit, Garmin and Samsung, and smart watches. Typically, these devices record steps walked, sleep patterns, calories expended, or heart rate and their functionality is increasing. Given the UK’s ageing profile and as part of the agendas of Active and Healthy Ageing and digital NHS, there is an increasing focus on maintaining health in later life and encouraging physical activity to preserve mobility and motor skills, and self-monitoring of health and medical conditions. The ESRC IAA project aims to produce a multi-way knowledge-exchange between key stakeholders for improving the design of activity monitoring technologies (and digital health wearables, in general) for older users, carers and medical professionals. The stakeholders will comprise of: academia; industry (manufacturers of digital health wearables); statutory and voluntary groups such as Bucks Vision, Dementia Friends; older people and carers through Age UK MK and Carers MK; and OU’s partnerships with medical networks. Our focus will be to build on and exploit recently gathered user-based evidence (from our previous Sir Halley Stewart Trust-funded project) on the functionality, usability and accessibility of wearable technologies, the accuracy and reliability concerns of stakeholders, and ethical considerations of data-usage. We gathered this evidence through user engagement on the role of wearable activity monitoring technologies in the health and well-being of people aged 55 years and over in the Sir Halley Stewart Trust-funded project - trialling devices with a group of older users and conducting surveys and workshops with multiple stakeholders: carers, people aged over 55 years, and medical and healthcare professionals. Our practitioner partners on this ESRC IAA project are: Age UK Milton Keynes, Carers Milton Keynes and Samsung, UK. The academic team consists of: Dr Duncan Banks, Dr Caroline Holland, Ms Catherine McNulty, Professor Shailey Minocha and Dr Ana-Despina Tudor of The Open University; and Dr Kate Hamblin and Dr George Leeson of The Oxford Institute of Population Ageing, University of Oxford. The project will be managed by Ms Louise Thomas of The Open University. We would like to know about your perceptions of using digital health wearables for monitoring the health and activity of the people you care for. It is not necessary for you to have used such devices for the people you are caring for to participate in this survey. Your inputs will help us to understand how similar health wearables could be effectively used if they became a part of healthcare: caring, monitoring and self-management of health. Our current focus is on activity trackers (e.g. wrist-bands from Fitbit or Jawbone, or smart watches from Apple or Samsung), which track daily fitness levels such as heart rate, sleep patterns, or calories expended. 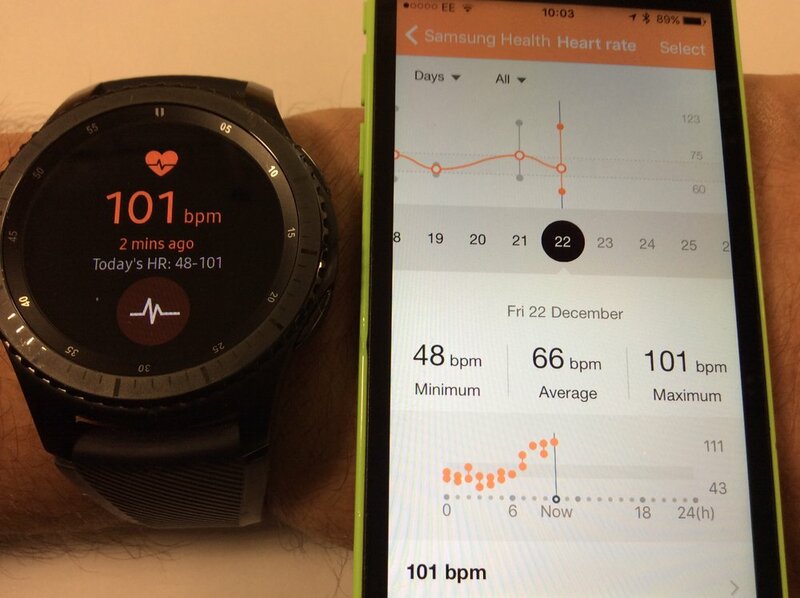 As a part of the Sir Halley Stewart Trust-funded Digital health wearables project (http://www.shaileyminocha.info/digital-health-wearables/) at The Open University, UK, we are running a survey: please visit https://www.surveymonkey.co.uk/r/health-wearables-for-the-person-being-cared-for or http://bit.ly/2iN4YSd to participate in this survey. The survey will take 6-8 minutes to complete it. Since these devices are not yet designed to accurately analyse data from wheel-chair usage, if you could fill up this survey only if you are caring for somebody who is mobile and not wheel-chair bound. 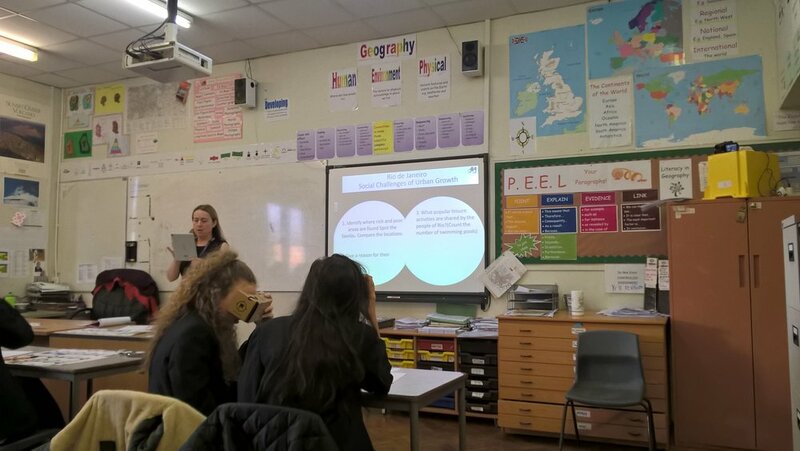 Google Expeditions (https://www.google.co.uk/edu/expeditions/) is a Virtual Reality (VR) approach being promoted by Google in schools globally. Google Expeditions are guided tours (field trips) of places that students experience on a smartphone through a virtual reality viewer called Google cardboard. The Open University (OU), UK are conducting a school-based research project (funded by Google and the OU; July 2016 - June 2017) on the potential use of VR via Google Expeditions in secondary school science and geography. The project (http://www.shaileyminocha.info/google-expeditions/) is being co-led by Field Studies Council, and UK's Association for Science Education and Geographical Association are the two partnering organisations. This workshop will provide an opportunity to try out Google Expeditions and to explore how they could be used to support teaching and learning, including fieldwork. Are Google Expeditions a threat to traditional field trips or could they become a complementary tool for strengthening the quality of outdoor learning, for example by providing an immersive technology which adds context and substance to pre-field preparation, in-field activities and post-field revision and reflection? There are full-time and part-time PhD studentships available at The Open University, UK as a part of the Economic and Social Research Council (ESRC) Grand Union Doctoral Partnership. The details of studentships are available here. Online collaborative learning: challenges and advantages. The deadline for applying for studentships is 20 January 2017.
digital (medical) education initiatives for healthcare staff through simulations in virtual reality and 3D virtual worlds. Our related ongoing Sir Halley Stewart-funded project on digital health wearables for older people is described here. This web-page and the blog on this website have further details/resources on our projects/initiatives related to the themes listed above. In the Google- and UK's Open University-funded project, we are investigating the role of Google Expeditions in Geography and Science learning and teaching in schools. Details of our project are available in this blog post. UK's Open University (Shailey Minocha and Ana-Despina Tudor) is working with Google and leading UK education organisations including the Field Studies Council (Steve Tilling and David Morgan), Geographical Association (Rebecca Kitchen and Alan Kinder) and The Association for Science Education (Marianne Cutler and Richard Needham). The project webpage on this site is here. We organised the fourth workshop of the Sir Halley Stewart Trust funded Digital Health Wearables project at The Open University on 14 October 2016. As discussed in our blog-post dated 9 October 2016, we are recording the experiences of 21 participants who are using activity trackers as a part of this project. The activity trackers are from Fitbit (e.g. Fitbit Alta, Fitbit HR), Microsoft (Band 1 and 2), and Misfit Shine. The workshop-discussions since June 2016 have uncovered a number of challenges people over 55 years experience with using the activity-trackers - from opening the packaging, accessing the instructions/manuals online, and to discovering the features of the device. We are investigating how the behaviours of our participants is changing – whether there is an increase in their activity such as walking or gardening, lifestyle changes, attitudes towards food/diet, and so on. How do they do how much of physical activity (and number of steps) is optimal for them (age; medical conditions, if any; etc.)? Does an increase in physical activity help towards the loneliness that people experience in later life? In addition, we have been eliciting their perceptions about sharing of the data with family, friends, carers and medical professionals. As discussed in this news item of our project, the wider implications of this project are in determining how digital health wearables can be used for self-monitoring and self-management of health by older people, and for remote-monitoring of specific conditions such as Parkinson's.